Making the right impression is as important as making a great entrance, it sets the tone for everything else. 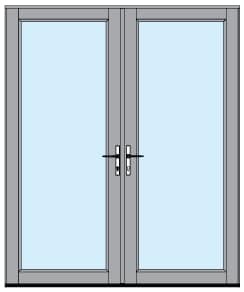 Sentry Doors have that solid, reassuring feel, with a fit so perfect they are watertight. With advanced security features, such as Jason’s innovative triple deadlock system, ensure your ultimate peace of mind. Available in single and double configurations and also now available in a timber look finish. A full complement of extruded couplers provides a neat window to door alignment. Our sturdy frame design maintains a minimum frame width of 76mm, designed for double brick cavity and framed construction. The frame comes supplied with a unique sub-sash to ensure the frame is built in square and plumb. Our improved seals reduce air leakage to produces an excellent air conditioning rating, ensuring you get maximum efficiency from heating and cooling your home.